House wrap often creates more damage than it prevents in straw bale houses. 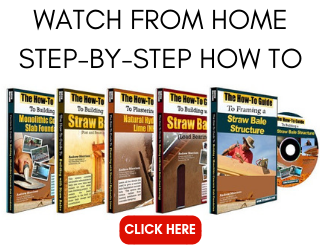 Why then are they required in straw bale building codes? The answer is not complicated; however, the impact of vapor barriers in straw bale houses is. For straw bale homes, the push has always been to provide the bale walls with a vapor permeable finish to allow any water vapor to escape the building. In most cases, this translates into an earth based plaster like clay or lime. These plasters have the ability to release vapor and thus allow the bales to dry out when the weather permits. Other plasters that are synthetic or cement based have limited ability to transfer the moisture away from the bales. In some cases, again depending on the weather or climate, the bales end up soaking up moisture from the environment which can cause decay in the walls. 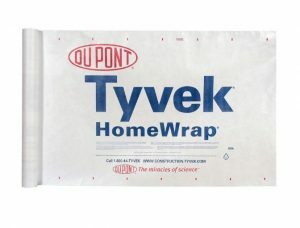 So if it is true that the bales need to breathe and that the plaster that is applied over the surface can influence the vapor transfer away from the bales, why would anyone use a house wrap at all? So here is the simple answer: because that is what people do on conventional homes. Because much of the code language for straw bale buildings is based on codes for conventional construction, some things just never get tested before they become requirements. I have built many straw bale homes and many conventional homes. In both cases, I find items within the code that really do not make sense for the individual situation; however, the code is not designed to address individual situations but rather large, blanket situations. As a result, I have had to fight for what I believe and then provide some type of proof or performance guarantee from an engineer. Although expensive, an engineer’s stamp is cheaper than a failed wall system. I do not use house wrap on my bale walls unless I really have to. In some cases, where the bales may be exposed to rain splash or snow drifts, I may utilize the material. In dry climates, I do not use the material at all because I believe the ability for the building to release moisture is more important than the attempt to keep it out. The picture above shows an example of a house wrap in the form of roofing felt applied to the bottom courses of bales. In this case, the home inspector required it on the exposed portion of a wall where wind driven rain rain was a concern. I was sure to NOT wrap the felt under the bales. This allows any moisture to drain free of the bales into the gravel at the base of the wall. Do not confuse the need for a house wrap material with the need for roofing felt over wood exposed to plaster. They are very different and the plaster protection is definitely needed to avoid cracks in the finish. The stripes on the wall of roofing felt are wood members covered before plastering. I have learned over the years that moisture WILL get in to your house one way or another. Believing otherwise is like believing I can stop it from raining when I want a sunny day. In light of that, it makes more sense to build so that moisture can escape once it gets in. This is a simple answer to a complicated question. Indeed, there are many people and companies out there that spend countless hours and currency researching the impact of house wrap on construction projects and the results of those studies point to the inclusion of vapor barriers in conventional construction practices. Because there is limited information about the impact of those barriers on bale homes, we, as builders, are left to use our common sense and what information we can find. One thing we know for sure is that moisture can cause irreparable damage to a straw bale house. Knowing this, it is imperative that you do whatever you can to protect your walls from water AND moisture vapor build up. Exactly how you do that will depend largely on your climate, your construction materials, your mechanical systems, and your design. 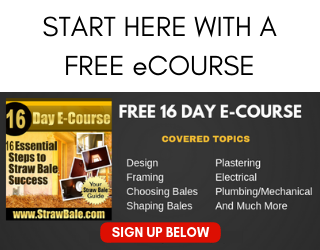 There are ways to build with bales that have a finish other than plaster. You need to skim coat the bales with plaster no matter what to make sure they don’t pose a fire risk, but that plaster can be cheap and sloppy (relatively so). You need a vented gap on the exterior between the bales/plaster and the back side of the siding. Keep in mind that finishing walls with plaster is actually a little bit easier than using rigid building materials in many cases. Good luck. Andrew – I live in climate where summer lasts only for 3-4 months and most of the year is much colder and winter is snowy. I was thinking that it might be good idea to try to stop hot moist air to enter bales from the inside of the house as this will happen 3/4 of the year. On the other side exterior plaster would be able to release vapor from the bales to the outside. Does it make any sense? Hi Marcin. I am not sure how you would repel the vapor from the interior. the method is key. It is indeed a good idea, but wrapping the house in house wrap or a vapor barrier is not a great approach in my mind. I’d prefer to see you use a plaster sealing material over the finish plaster to seal things up. Be sure to leave the exterior plaster free from the seal so it can release whatever it gathers. One option there is to use silicate paints as they allow vapor to move through but stop water from entering the plaster. Hello, I am interested in buying a “homestead”. (structure completed except inside walls are not sealed). Is there any way to check the moisture inside the bales? What should I check for/pay attention to while inspecting the homestead? Hi David. First thing is to make sure the walls were built with straw and not hay. Hay is a food source, not a building material. You can check the moisture content of the bales with a moisture meter. I use a Delmhorst F-2000. In terms of what else to look for, that’s a loaded question as there are so many things to consider. Too much to shove into a comment. At the very least, tight walls, proper anchoring, moisture content, adequate mesh work, no rebar pinning, and many other details. Hope this helps you get started. I want to be able to build my own house in the future and am currently looking at all my options. I came across straw bale houses while researching insulation and really like its insulation value, the fact that it would be cheap for me, and the awesome window seats. However, I live in an area with driving rain and snow plus I don’t particularly like plaster sided houses. I would really like to have a stone house with straw as my infill insulation but I can’t really find any information about such method. Any thoughts? Hi Ashley. Glad you found straw bale construction in your research and it peaked your interest. 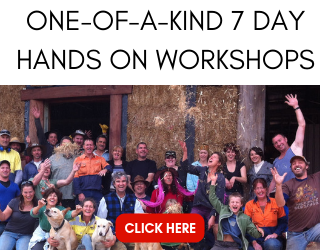 You can definitely build a bale house without having a plaster exterior. There are lots of options available to you for siding finishes. Keeping the costs low will be the harder part as stone facade is an expensive finish regardless of the house being a bale structure or a conventional home. Cheers!